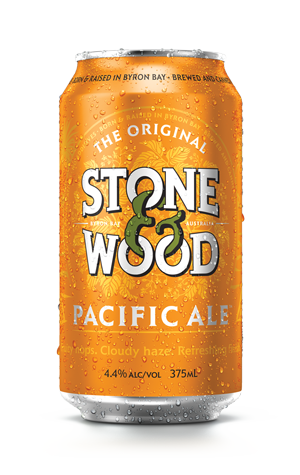 As Stone & Wood’s Pacific Ale waltzes into its second decade, the beer that’s inspired countless other locally brewed, refreshingly tropical releases has made the permanent move into cans. The beer will still be available as a stubby but the beer’s latest evolution – one that plenty have clamoured for – shows how prevalent the can has become for craft brewers in Australia and seems particularly suitable considering this was always a beer designed for enjoying after hot days in the surf of the Pacific Ocean. Producing a beer to enjoy in a beachside beer garden might seem a humble enough goal but Pacific Ale's story has claimed a far larger place in Australian beer history. It was the first release to truly showcase the aromatic potential of the locally developed Galaxy hop and its distinctive, passionfruit-led personality. You can read more about the beer’s story, its creators and its lasting impact on the Australian craft beer industry in our reflection on its first decade here. Late in 2018, as the brewery celebrated its tenth birthday, a very limited number of Pac Ale tinnies were shipped across the country but now they're sticking around. And, while it may be a beer created to enjoy post-surf at Byron Bay, as much of the country continues to swelter through the summer of 2018/19, many a can of Pacific Ale will likely be cracked in the months (and years) to come. Ocean or no ocean.